This medical app was designed for physicians (radiologists, urologists, residents or practicians...) willing to learn prostate MRI interpretation. It is based on a progressive pathway showing you how to understand, then read, then interpret multiparametric prostate MRI examinations, from the simplest to the hardest ones, selected from real-life practice in a reference imaging center. By working on more than 30 highly detailed cases, reading the courses and the reference database, you'll have the power to learn all the fundamentals of prostate MRI interpretation at your pace, progressively, even in an entertaining way, just like if someone was driving you. Take a look at the future of medical education ! Try it. No turning back. 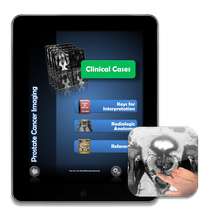 Includes the first cases of the course, allowing a discovery of prostate diseases through MRI.